In Wesson, Mississippi, a man named John Whittaker learned that the secret to any man’s success is making sure the queen is happy—in his case, his wife, Pam Whittaker. With this knowledge at his disposal, he found himself to be perfectly up to task when Pam recommended that John become a beekeeper with his father-in-law, George Philyaw. This happened roughly ten years ago, and the trio soon owned Broken House Farms with several hives and dreams of selling honey. While they’re not exactly making millions, they have more than enough honey to do with as they please, bringing in between 150 and 200 gallons per season and selling it to various stores throughout Lincoln and Wesson Counties. When the Whittaker’s started as beekeepers, they knew little about the actual craft, but they’ve fortunately learned the trade since then, managing over 50 beehives in total. 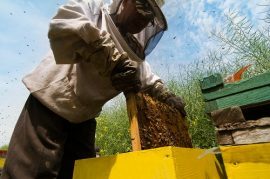 “We originally started buying bees, then we learned how to raise our own and how to make queens ourselves,” says John. While George has retired, the younger Whittaker’s still have full-time employment—John works as an investigator for the district attorney while Pam works in social work for the Berean Children’s Home. As the Whittaker’s learned in their time as beekeepers, beehives are designed so the queen bee—who is bigger than worker honeybees—isn’t physically capable of getting to the top and laying eggs within the honeycombs. Worker honeybees—who are female—put the nectar they gather into the honeycombs and eventually make the honey they intend to use to get them through winter. The Whittaker’s “rob” or harvest their hives, but not so much that the hives die. “We don’t completely rob them. We give them something to live off of,” John said. Per Pam, “The main thing is to keep the bees not stressed out. We want to keep them as happy as possible.” To acquire their share of the honey, the Whittaker’s use their smoke gun in order to keep the bees calm while the honey is pulled. Even after the bees have calmed, the Whittaker’s will sometimes wear traditional bee suits to cover their skin and faces, though they have been known to just wear plain clothes. Ready to try raw honey and see what all the fuss is about? Manuka Honey USA offers some of the best-tasting Manuka honey on the market today. For more information about our products or get an order started, click here. And, remember, we offer FREE shipping on all orders of $150 or more.